The unfortunate tale of a movie screening gone horribly wrong. Last year, I went on a first date with a nice young woman whom I had met socially. She was quite spirited with a subtle firebrand wit beneath her bubbly persona. Needless to say, I was looking forward to seeing her again; however, as our first dinner date progressed, small red flags started appearing. To be more accurate, it was ONE red flag large enough to make a matador envious. I couldn’t get a word in edgewise in our “conversation.” She hopped and skipped through topics faster than I could keep up with. At one point, I swear she completely changed subjects three times within the same sentence! Clearly, she was either self-centered, adorably nervous, or a grammatical virtuoso capable of bending the power of sentence structure to her will. Within the span of about three minutes, she had broached the topics of Trump vs. Hillary, Tangled vs. 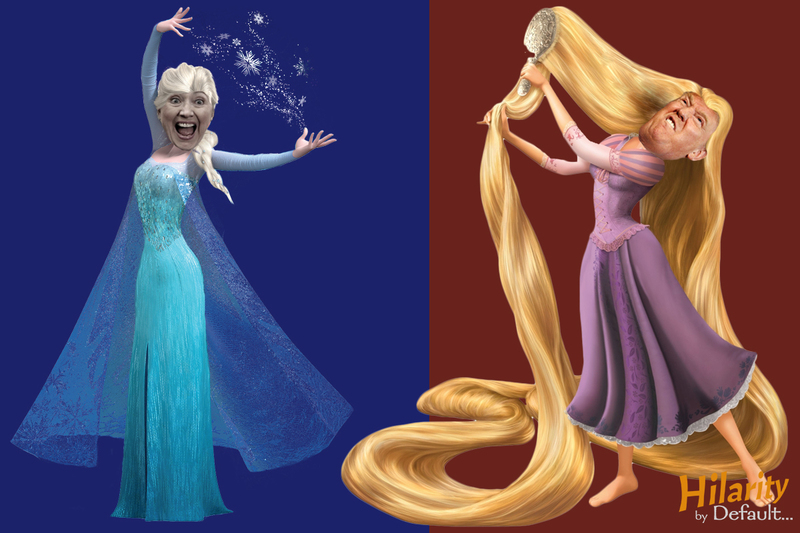 Frozen (which, honestly, could have been a continuation of Trump vs. Hillary) and Venezuelan weather patterns (I think). I had no alternative but to course correct. I figured that if she was nervous, I’d make the situation worse by not attempting an interaction. Fortunately, I found a small window when she momentarily stopped to rehydrate. “What kind of movies do you like?” I asked, figuring that since I review new movies every week I would have a plethora of items to talk about. Her eyes lit up as she began to list some of her favorite films. She liked “just about everything Disney,” Minions, The Shawshank Redemption (tragically, the only time in history the two have ever appeared together in the same sentence), and 1986’s Little Shop of Horrors – her all-time favorite. She had never seen the play or the original 1960 version but the Rick Moranis-led sci-fi musical romp about a geeky guy unwittingly gaining fame by nurturing a giant carnivorous plant ranked as her most beloved film since she was a little girl. From the Ashman-Menken songs (before they moved on to The Little Mermaid, Beauty and the Beast, and Aladdin) to Steve Martin’s hilarious turn as the sadistic, laughing gas-addicted dentist, every celluloid frame was precious to her – which gave me an idea! I mentioned that I owned the Blu-ray and invited her to my place for after-dinner drinks and a movie. Within 30 minutes, I had tossed the Blu-ray on and we settled on my couch for a cozy screening. We laughed and she sang along (my attempts at singing would have invalidated the definition of the word “horror” in Little Shop of Horrors). The aforementioned red flags had been replaced by singing, man-eating plants from outer space (“a win is a win,” I told myself). Unexpectedly, the evening took a dark turn. At first, I didn’t give it much thought but as the third act began, I noticed that my date had uncharacteristically become dead quiet. Immediately, I could tell that something wasn’t quite right. Before I could say anything, she abruptly let out a scream as the giant plant began to devour Audrey (Rick Moranis’ love interest in the movie). “What’s wrong?” I asked, praying that my neighbors hadn’t called the police. “I don’t remember this! Did you mess with this movie?” Before I could answer, Moranis was already cradling Audrey’s mangled body as she let out one last whimpering reprise of their love song before dying. With tears running down my date’s face, I realized my haphazard error. “Crap! This is the director’s cut! You haven’t seen it before?” “NO!” she yelled as she turned back towards the film. “What the hell?! 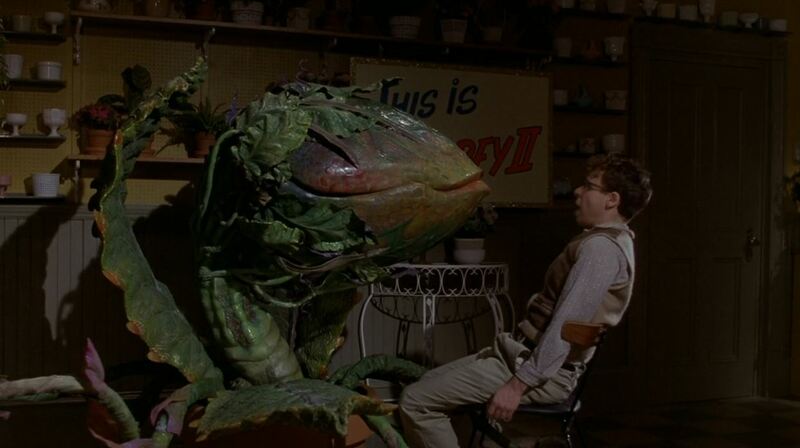 Don’t eat my Moranis!” she sobbed as the plant ate Rick, spitting out his trademark glasses. 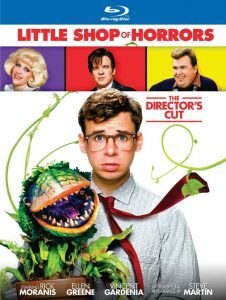 The recent release of the Little Shop of Horrors Director’s Cut was a wish come true to fans of the original stage version. Adapting the play’s dark comic ending to the film production prompted a harsh early test screening response. Convinced that this would mar box office returns, the studio scrapped this ending in favor of a happily-ever-after version. Outside of a few stills and black-and-white clips, the initial downer ending didn’t see the light of day in its full glory for over a quarter of a century. When it was ultimately released on Blu-ray in 2012, I jumped at the chance to finally see it – a leap that had suddenly landed me in my own Venus flytrap of trouble. “I’m so sorry,” I pleaded. “Let me put on the original version instead.” She grabbed the remote with a vengeance-seeking simmer in her eyes as if I had just brutally murdered her magnanimous Moranis. She was going to see it through. 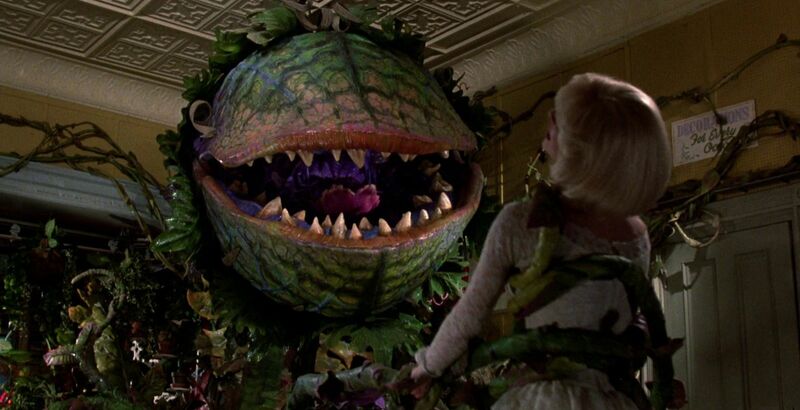 As she sat at the edge of the couch watching the world get overrun by the giant space alien vegetables to the beat of the film’s final musical number, “Don’t Feed the Plants,” the lyrics suddenly gained new meaning for me. “Hold your hat and hang on to your soul!” they warned as if narrating my current awkward situation (part of me also wondered that had it been released today for the first time, if a movie containing a song entitled “Don’t Feed the Plants” would be lambasted by protesters accusing it of normalizing “anti-green” messages). It may go without saying that as the movie ended, so did any chance of a successful first date. I spent the next hour attempting to comfort her as she compared this experience to watching The Little Mermaid with a surprise alternative ending that featured the mermaid getting caught and devoured by predatory fishermen. I dared not reveal Hans Christian Andersen’s original version of the popular fairy tale. I guess that as a learning experience, there can only be one logical takeaway. This is Hilarity by Default warning: please, whatever they offer you, beware of obscure nostalgic director’s cuts! I should note that, in full disclosure, I actually got my former date’s blessing to post this (she’s a fan of the site). Oh, and speaking of Venus flytraps, those awaiting my Song of the South review should look forward to it soon as I needed just a little extra time covering what is considered to be one of the most controversial movies ever made. Check it out here next Wednesday!